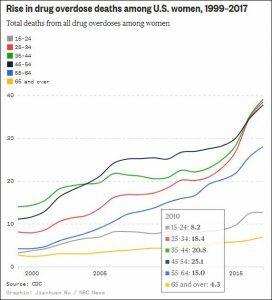 Experts said they were startled by the skyrocketing overdose deaths among women, and they could not explain it based on existing research or evidence. They said public health resources must be targeted at women, too, to prevent and reduce their substance abuse and how it is taking an increasing toll on them. Most likely there are hidden suicides here. It can be very difficult to tell…Sometimes there are clear indicators like suicide notes. And sometimes unfortunately, people have died, and we find a fatal amount or combination of drugs in their system, but we don’t know how or why they got there. I’m sure there’s a lot of overlap between misuse and unintentional overdose and those who intentionally overdose to kill themselves. Indeed, other experts earlier had warned about increases in women ending their lives. The National Center for Health Statistics has found that suicide death rates between 2000 and 2016 increased 21 percent for boys and men, compared with 50 percent for girls and women. In my practice, I see not only the harms that patients suffer while seeking medical services, but also the damage that can be inflicted on them and their loved ones by dangerous drugs, especially the thoughtless and excessive prescribing of potent and addictive opioid painkillers. Big Pharma, doctors, hospitals, insurers, and too many others in American health care should be ashamed of themselves because they have created a lethal scourge with opioids, opening the way for illicit and even more dangerous drug. And, despite claims to the contrary, the response by the administration and Congress has been too late and too little still, as the rising women’s overdose data show. Heroin laced with the powerful synthetic opioid fentanyl has killed thousands of … drug users in the past several years, driving a largely overlooked urban public-health crisis. Since 2014, the national rate of fatal drug overdoses has increased more than twice as fast among African Americans as among whites [the CDC says]. In this new explosion of deaths, the nation’s capital is ground zero. The District saw 279 people die of opioid overdoses last year, a figure that surpassed the city’s homicides and was greater than three times the number of opioid deaths in 2014. More than 70 percent of cases involved fentanyl or its analogues … and more than 80 percent of victims were black. Even as the nation marshals more resources to battle the opioid crisis, Americans can’t stop their hard work to stamp out social inequities and injustices that also injure too many still. A key insight into the opioid crisis in rural and ex-urban areas has been economists’ work on “the disease of despair” — the hopelessness, impoverishment, isolation, and depression that afflicts white men, middle aged and older, and can help send them spiraling into substance abuse, overdoses, and suicide. We’ve got major work to do to combat the silence and shame surrounding suicide. (If you or others you know are struggling with this, please consider calling the National Suicide Prevention Line, toll-free at 1-800-273-8255). We also can’t ignore how racism and sexism put and keep down women and the young in America’s increasingly diverse society. They’re major “social determinants” of health. Sexism persists as a major problem in medicine. And, while there may be signs for optimism for women in national politics, the perils of “toxic masculinity” — for men and women, girls and boys — have become worrisome enough that psychologists have issued new warnings about them. More could and should be said on these and other societal ills. But to paraphrase — geez — a Big Tobacco slogan that has become a part of the language: We haven’t come far enough, baby, and we have a long way to go to improve the health and well-being of American women and men.